If you ask many shooters how they would best describe the process involved in achieving the extreme accuracy that we in Benchrest strive for, they might sum it up in two words. Removing variables. Due to the fact that Competitive Benchrest has evolved into an endeavor where every thousandths of an inch on the target counts, it can be said that we take this process of removing variables to the extreme. The evolution of the modern Benchrest Rifle, and the components that complement it, is no accident. Over the years, countless shooters have spent untold hours in the shop and at the range figuring out what works, and what does not. 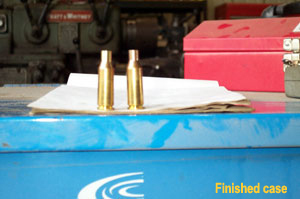 When you examine a modern Benchrest Rifle that is used in the competitive format, you can see that everything that can be done is done, with one purpose in mind, to insure that the next bullet that travels down the barrel will end up on the exact same spot on the target as the one before. One of the more precise aspects of removing variables is what has commonly known as Neck Turning. In simplest terms, Neck Turning can be described as removing metal, using a precision process, from the outside diameter of a case neck in order to achieve a certain result. In Benchrest, we turn necks to achieve two goals. The first is to insure that the wall thickness of each neck is uniform. This allows the bullet, when seated, to be truly in the center of the chamber and throat of the barrel. It does little to pay a top Gunsmith your hard earned money to insure that your barrel work is performed so that the chamber, threads, barrel shoulder and other subsequent machining operations are indeed truly straight with the barrels inside diameter, if you use ammunition that will negate his best efforts. The second reason that we turn necks is so that we can obtain an exact clearance between the loaded round and the neck portion of the chamber. Of course, to achieve this, you must start with a chamber that is designed with this in mind. A rifle must, or should, have a chamber with a neck that is small enough so that the case necks will have sufficient material that can be removed to obtain this fit and not be so loose as to cause other problems. For instance, many shooters attempt to turn necks that are to be used in a SAAMI spec chamber resulting in excessive clearance between the neck and the chamber. This is simply trading one set of problems for another. The best example of the proper application of Neck Turning can be found in a typical Benchrest Rifle chambered in 6PPC, with a .262 neck. Since the normal necked up size of the parent case, usually 220 Russian, when measured over a seated bullet, is around .268, there is plenty of metal that can be removed so that the shooter can fit the necks to any dimension that is desired. Since these measurements are often held to within .0001 inch, ingenious ways of turning necks has evolved so as to assure the proper wall thickness and concentricity with the inside of the neck. By far the most popular way of turning case necks is by hand. There are multitudes of manufacturers who have come up with some pretty clever devices that allow a shooter to turn necks with a high level of precision and achieve extreme tolerances, using the shooters own muscles as power. These hand powered neck turners are designed so that a shooter with very little other machine shop skills can achieve results that are compatible with the other aspects involved in solving the accuracy equation. As you can see by the accompanying pictures, there are a few items that must be acquired before starting. 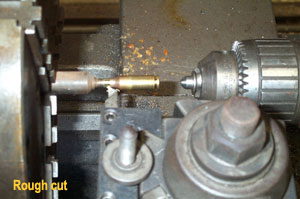 First, you will need a Jacobs Chuck that will open to ½ inch and fit the tailstock of your lathe. You will need a piece of steel, 5/8 diameter works fine. I personally use Stress-proof, which has a free machining and anti-gall quality. This piece should be about four or five inches long. 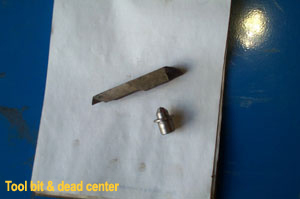 You will also need a piece of material out of which to machine a small “dead center” that will fit in the Jacobs Chuck. This could be aluminum, brass, mild steel, or anything else that you can find. You will also need to acquire a piece of High Speed tool steel, I use ½ inch square Rex-95, which can be obtained from any machine tool warehouse. The first step is to machine your little dead center. There is nothing particular about this. It has a 60 degree point on one side that will locate in the primer pocket with a major diameter of about ½ inch, and a .440 (approx. ), diameter turned fit on the back side to fit in the Jacobs chuck. This will be used to push the case up onto the mandrel that you will turn later. The accompanying picture probably shows more than I can explain. The next step is to grind your neck turning tool bit. On the left hand side of the tool bit, you grind a cutting surface 90 degrees to the shank. The back half, or right side, of the tool will be ground to a 30 degree angle. The point where the straight side and the 30-degree side meet should have about a .020 radius. You are now ready to chuck you piece of steel up and machine the mandrel that will be used in the actual neck turning operation. Chuck the piece up with about 2 inches hanging out from the chuck jaws. Next, measure the pressure ring, or base, of one of the bullets that you will be using. You want to turn a fit on your piece of steel for about 1 ¼ inches long that measures the exact same size as your bullets pressure ring, or base. You also need a polished finish on this fit, as you are going to be pushing the cases upon it. I shoot for about a 16 finish. You can judge this for yourself. You then need to machine a long “lead” onto the turned fit. The small end needs to be smaller than the inside of the case neck that you will be turning. I make this fit about ½ inch long, so as to give a gradual advance from the small diameter to the major diameter of the mandrel. This piece serves two purposes. The first is to neck your case up to the desired size, (in this case, 220 Russian to 6mm), and the second is to act as a driving mandrel while turning the necks to their specific size. You are now ready to turn necks. Take your Jacobs Chuck and insert it into your lathes tailstock, after wiping the quill out and the shank off so that it will “seize”. Insert the .400 diameter shank of your little dead center piece into the Jacobs Chuck. You can just tighten the scroll by hand, since it has a shoulder that will keep it from moving back. Put a thin film of any kind of thin oil on the mandrel. Place a case onto the tapered lead of your mandrel. 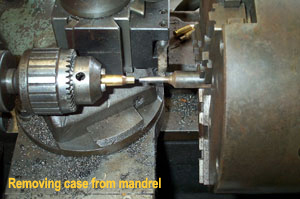 Using the point of your dead center piece mounted in the Jacobs Chuck, push the case all the way upon the mandrel to within about 1/8 inch of the shoulder, or non-turned portion of your mandrel. 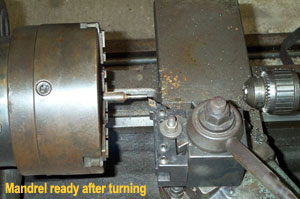 Next, set your tool bit up in the tool holder so that the 30-degree shoulder is toward the tailstock. 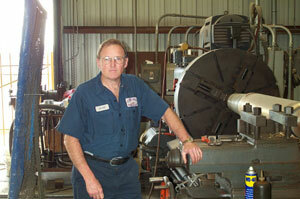 Touch your tool off, and take a rough cut, feeding by hand, FROM THE CHUCK END OF THE NECK TOWARD THE TAILSTOCK. When the tool reaches the junction of the shoulder and the neck of the case, kiss the junction with the 30-degree side of the tool so it leaves about a 1/16 shiny line on the shoulder. Then, using the lathes slowest feed let the tool cut back over the roughed neck in the direction of the chuck. This will be your finished cut and establish your finished size. Measure the neck. Since your mandrel is the exact size of your bullet, the neck, on the mandrel, should be machined to what ever you wish your finished size to be. For instance, if you have a .262 chamber, and you want .001 clearance over the loaded round, then make the case as measured on the mandrel to .261. In this case, we are not concerned with the wall thickness. Since you mandrel represents the actual size of the bullets you will be using, the necks as measure over the mandrel will be exactly what you desire. You might have to sacrifice a few cases to get the size exact. Remember, you rough cut by hand feeding toward the shoulder, and then, without disturbing the tool, let it power feed, or “back drag,” over the fit for a finish cut. After you are satisfied that everything is correct, you can remove the case, which is now completely necked up and turned. Again, use your Jacobs Chuck, only this time for case removal. Remove the small dead center piece and run the tailstock quill out so that the jaws of the Jacobs Chuck surround the case. Tighten the chuck scroll by hand and using the tail stock quill, pull the case off. It will come off quite easily. Since the bodies of cases are tapered, it will grip the case in a positive manner when you pull it off. You are now ready for the next case. Once you get into the rhythm, you will be able to do at least a case a minute. I can do 100 in about an hour, once I am set up. When I set a lathe up to do this, I try to do a box of 100-sorted cases at a time, more if I have them on hand. There are a few tips that I can offer that are not a necessity, but do make things easier. I have a little mist cooler that I keep spraying on the mandrel at all times. This keeps it cool so that it doesn’t pick up heat and change the diameter of your mandrel, which will affect the size of the finished case. This spray mist cooler also serves as the lube when pushing the cases upon the mandrel, as well as a cutting fluid for the tool bit on the brass case. With this set-up, you can turn any necks that are on cases that do exceed the opening diameter of you Jacobs Chuck, unless you come up with another means of removing the turned case from the mandrel in a straight manner. 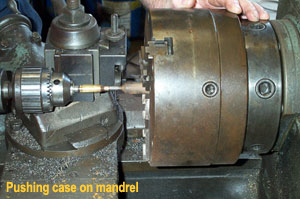 Some might also ask as to why I do not just use a lathe center to push the cases on to the mandrel. If I did that, I would have to remove it each time to install the Jacobs Chuck in order to remove the case. It is just quicker to use the chuck as a center holder and case remover. And remember, if you remove the mandrel from the lathe chuck, you MUST machine a new one when you are ready to turn some more necks. It is impossible to true it up again to within the tolerances that are demanded in ne ck turning. In conclusion, the time-tested method of preparing cases with one of the hand turning tools is precise and produces extremely uniform necks. But for those who have access to a small lathe and are looking for an alternative that is very versatile, accurate, and fast, give this a try. In actuality, this is a method that allows you to expand your necks and turn them in a one step. It does away with having to have different turners with different mandrels in order to neck turn different cases. For example, to do .30 caliber necks, just turn a mandrel to accommodate .308 diameter bullets. It is also a good exercise in precision lathe practice. It takes a certain amount of skill to learn the little quirks of your lathe that will allow you to be a better machinist. Since I do not do that much actual machine work in my shop anymore, performing small task such as this helps me keep my skills honed to a fine point. In fact, I like doing cases in this manner so well that I do not even own a hand neck turning tool. Good Luck.